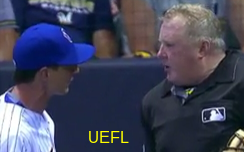 HP Umpire Bill Miller ejected Brewers Manager Craig Counsell for arguing balls and strikes in the bottom of the 7th inning of the Reds-Brewers game. Replays indicate all nine callable pitches thrown by Reds pitcher Michael Lorenzen to Brewers batters Scooter Gennett, Chris Carter, Hernan Perez, and Kirk Nieuwenhuis during the relevant half inning were properly officiated (9/9 = 100% Accuracy), the call was correct. At the time of the ejection, the Reds were leading, 7-0. The Reds ultimately won the contest, 7-4. This is Bill Miller (26)'s fourth ejection of the 2016 MLB regular season. Bill Miller now has 11 points in the UEFL Standings (7 Previous + 2 MLB + 2 Correct Call = 11). This is the 131st ejection report of the 2016 regular season. This is the 53rd Manager ejection of 2016. This is Milwaukee's 1st ejection of 2016, T-4th in the NL Central (PIT 12; CIN 6; CHC 3; MIL, STL 1). This is Craig Counsell's first ejection since August 15, 2015 (Fieldin Culbreth; QOC = U [Replay Review]). This is Bill Miller's first ejection since June 29, 2016 (Andy Green; QOC = N [Runner's Lane Interference]). Wrap: Cincinnati Reds vs. Milwaukee Brewers, 8/12/16 | Video available via "Read more"